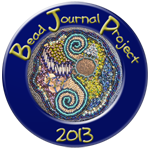 Didi's beaded goodies: Another month gone! Well the past month has been busy. The holidays went quickly with a bit of all sorts done around home and getting some of the major needlepoint projects done. I did not go to the Stampin up day as it was time away that I could not afford from home. However, labour weekend saw me in wellington with Stephanie and Holly (see Stephanie’s blog for photos of our weekend). It was lovely and we had the most amazing summer like weather on the Saturday, nice on Sunday, raining on Monday but David came to breakfast with us so that was good. Since then I have been stitching on walk on the wide side and started the Angelina fibre section. I have also been thinking about things to make to sell and for presents. I have made a couple of luggage labels and they are quite fun. I gave one to Alice for her birthday this month as she is off to California for a short holiday before her last year of study. 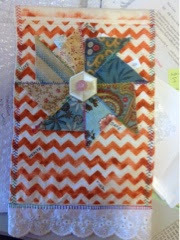 Also I have been making a couple of prayer flags and here is the one that I posted off for a swap on swap-bot. This was great to make once I was started and thinking of doing a couple of bunting swags as well for Christmas to decorate the staffroom. I made bunting at the start of the year for the Amess house as we have been in charge of the social club this year. Last weekend mum and Fiona came to stitch so we made up the kits for the guild Christmas party. On Sunday mum and I made a Christmas decoration, which was really nice. I am not making as many this year for presents so hope to have at least six done and that will be the end of them. Sometimes I think people don't appreciate them and then occasionally it is easier to buy something. This is always a dilemma for me as I like to make things but then get less in return. As we are off for Christmas I will have to make a couple to take with me. Who knows where we will be for Christmas. 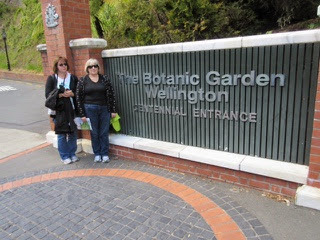 Holly and I at botanic gardens. 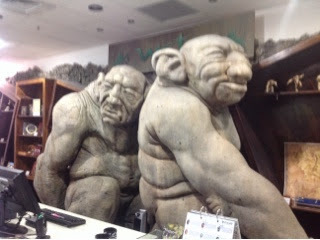 A well photographed feature in Wellington airport. Prayer flag - titled it a windmill of wishes as vanes are open to hold a small paper wish.